Patti Brady is the Working Artist Program Director for Golden Artist Colors. She has developed curriculum for acrylic classes for artists and art educators. Patti currently has trained and manages 42 national and international artists for the Golden Working Artist Program in the US. Canada, Korea, France, Austria, Spain, Mexico and the Netherlands. 2004 and 2006 she traveled to Japan for Golden Artist Colors to lecture at Universities in Tokyo, Osaka, and Kyoto. Her paintings and prints have been exhibited nationally and reviewed by the New York Times. She has exhibited at the Brand Library, Glendale, CA., Arch Gallery, Chicago, IL., Mills College, Oakland and U.C. Berkeley CA., Greenville Museum, Lander College and U.of SC. Furman University, Governor’s School, USC Upstate Curtis R. Harley Gallery, Gallery 80808, Columbia SC, and City Gallery, Charleston SC. Her work is in the collection of Greenville County Museum, The Contemporary Collection of MSUC in Charleston SC, (the largest collection of contemporary South Carolina on permanent display), and in The Mark Coplan Collection at the South Carolina State Museum and County Bank. My imagery is most currently inspired by patterns found in fabric and wallpaper, Damask, ornamentation and polka dots derived from botanical forms. The shapes have morphed from square to oval to biomorphic and Rorschach and are designed with paper and scissors or an iPad. There is an obvious feminine sensibility in all the work. I like the term “femmage” coined by Marion Schapiro, meaning a combination of feminine and collage. My work always has the intent of being decorative and beautifully ornate while invoking questions of what the pattern and patterning elicit in reference to what it means to be feminine. My physical vocabulary is acrylic paint, acrylic mediums, and color. 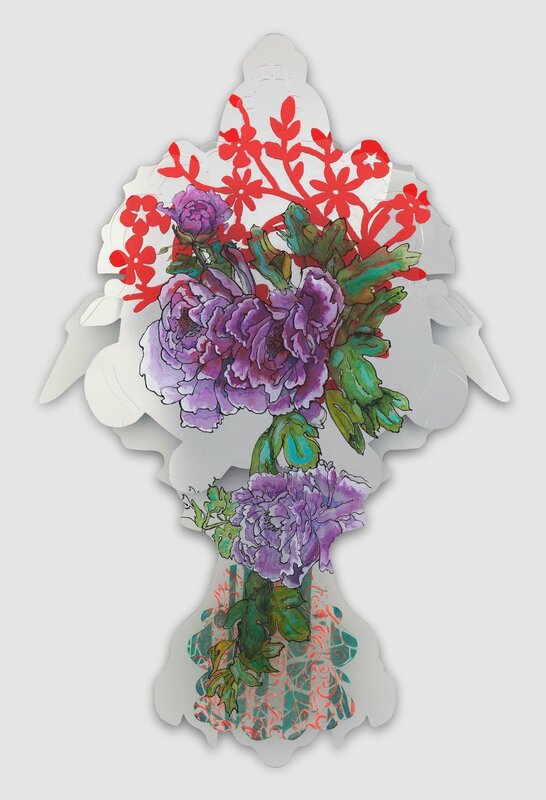 Currently, I am exploring layers of transparent plexiglass and mirrors. The titles refer to historically famous prostitutes and to contemporary taggers.